Well, after working fine for the last six years Netflix has decided to drop support from its app. The company claims it can’t control the user experience on third-party devices that now work with Airplay so it would rather just stop allowing it. Airplay, in case you haven’t used it, is a way to cast video or photos from a mobile device app or laptop to a TV or streaming media player. 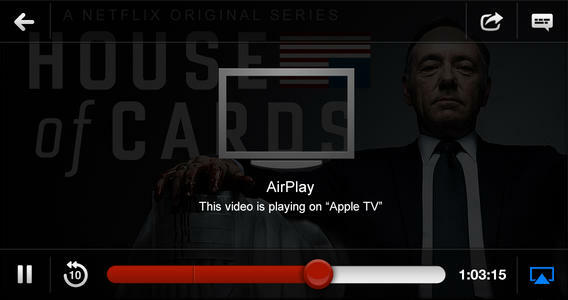 In most cases the Netflix app itself is a far superior way to view content, but Airplay was good to have as an option. One might think Netflix is getting protective of its content and service (kind of like when Amazon stopped selling Apple TVs), but there could be more. When Apple launched its Apple TV+ service a couple of weeks ago Netflix wasn’t among the subscriptions offered. Instead, the company decided to continue to sell its own memberships. But, there may just be a lack of interest from Netflix in making AirPlay certifiable (meaning, controlling the user experience) on all devices. After all, it is an Apple product. Netflix officially made a statement on the matter (see below), but skirted any reason beyond their inability to distinguish which devices are being used in conjunction with AirPlay. It’s unlikely that, at least for now, Netflix would go any further than removing AirPlay support. Apple is, for what it’s worth, still a hardware/software company. It would be hard to imagine Netflix only providing apps for certain TVs and streaming media players without the inclusion of devices from companies like Amazon and Apple.